Mat Irvine: In the words of Airfix, “…We're excited to announce the launch of the first Airfix Yearbook. 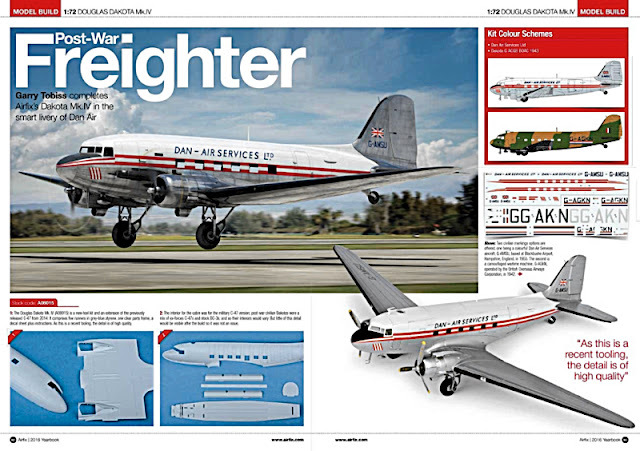 Rather than just being a traditional product catalogue, the Airfix Yearbook will be your one-stop source of information for all things Airfix in 2016, with exclusive news and information about the latest products and new releases for the year." 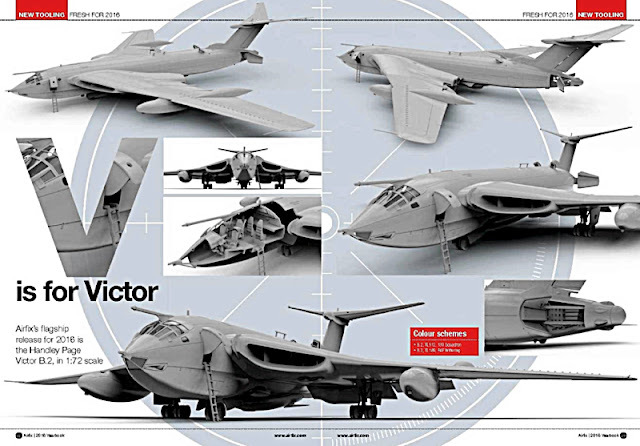 Top of many modellers' 2016 build-list will be the 1:72 scale Avro Shackleton maritime patrol aircraft. The four-engined machine was descended from the Lancaster bomber, and flew in various forms for more than 40 years. Given the reduction in brand new kits from the world’s kit companies, you might be forgiven for assuming that catalogues would be either thin on the ground or just ‘thin’. In fact, the opposite seems to be the case, with both Revell and Tamiya issuing meaty productions every year. And this also applies to Airfix, especially now that for 2016 it has released not just a catalogue, but a packed-to-the-rafters production. New kits spread shows (below top left, clockwise) Mosquito, Defiant, Sea King, Stuka, BE2C. There’s a reasonably comprehensive history of Airfix, from its beginnings in 1939 and ten years later, its first kit, the famous ‘Little Fergy’ Fergusson tractor. The history includes the most recent big change, the Hornby rescue of 2006. The 2016 Yearbook has a fascinating article on building military dioramas (below) which is enough to get a beginner really interested in this aspect of the hobby. Next comes paints and accessories, featuring the Humbrol range. Then there's a look at what’s new for 2016 which, if you are an aircraft buff, looks to be a mouthwatering year. If your interests are elsewhere, the outlook is perhaps not so good, but of course worldwide, aviation is the biggest modelling subject. Plenty of new stuff revealed in the pages of the 2016 Yearbook (below) such as the new-tool 1:72 scale BE2c (bottom right). It would be good if Airfix could scale the kit up to 1:48 at some point, to launch a new range of World War I aircraft. 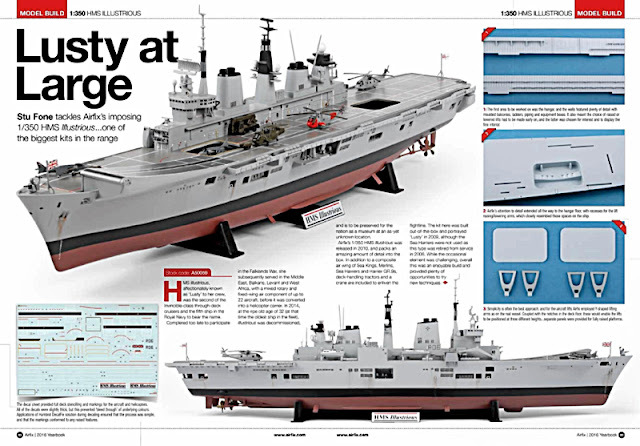 Specific builds in the 2016 Yearbook feature such subjects as the 1:72 scale Bristol Beaufighter and DC-3 Dakota, plus the 1:350 scale HMS Illustrious, and dioramas utilising the World War II resin buildings. 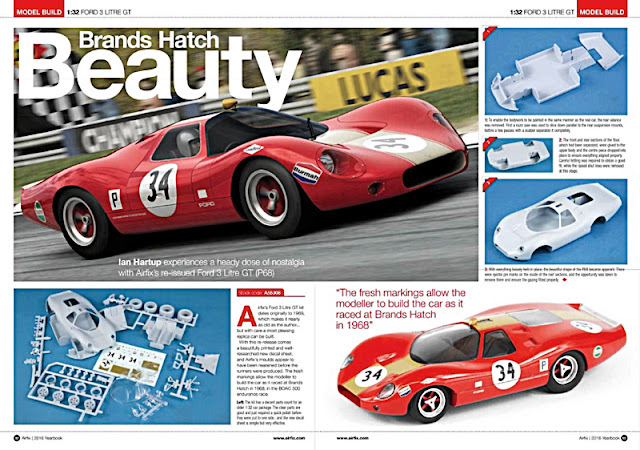 If you’re a motoring fan you are not totally ignored, as there is a build of the 1:32 scale Ford 3-litre GT. World War II fans get plenty of military vehicles (below) to be used with aircraft for dioramas. Finally, you get the catalogue itself, which runs in Airfix ‘Series’ order, with plenty of 1:72 scale Series 1 and Series 2 subjects, though Series 3 also includes 1:144 scale airliners such as the Vickers Vanguard. Buy the 2016 Yearbook direct from Airfix here. Attractive and interesting articles (below) and the new name mark out the Airfix 2016 Yearbook from previous editions.